The American M16 halftrack, featuring an M45 Multiple Machine Gun Mount, is a relatively famous vehicle. The M45 mount boasted quadruple .50-cal machineguns in an effective antiaircraft vehicle. The next evolution of this weapon system was to mount it on a large twin-axle trailer (known as M51 .50 Multiple Machine Gun Carriage), though this proved a little unwieldy. Mounted on an M20 trailer and with the armored shield removed, the modified system was called M55. Developed by Kimberly-Clark Corporation, it entered U.S. Army service in 1943, and around 10,000 were manufactured up till 1953. It was commonly pulled by a 2½-ton truck, but lighter vehicles could also do the job. Able to fire at a rate of 450-575 rounds per minute, the M55 was lethal against both low-flying aircraft and ground targets. Interestingly, after D-Day, the M55 trailer mount was available in greater numbers than the M16 halftrack. The weapon was also used during the Korean War and even as late as the Vietnam War. As mentioned in the opening, this is the same basic mount that comes in Dragon's M16 MGMC kit. The new addition is the trailer. This comes with a number of new tooled parts and allows one to pose the kit either on the ground and ready for use, or in a travel mode with the wheels attached. The rather fanciful box illustration shows the gun in use with the wheels attached, but in all probability, this would not have actually occurred due to the recoil and need to keep as much of the mount on a solid surface as possible. I also doubt if its victims would have the consideration to crash right next to the gun that shot it down. Anyway, the molding is superb as you'd expect from what is basically a near brand new molding. Photo etch is limited to a strip that goes along the base of the gun mount and decals are for the ammo drums. 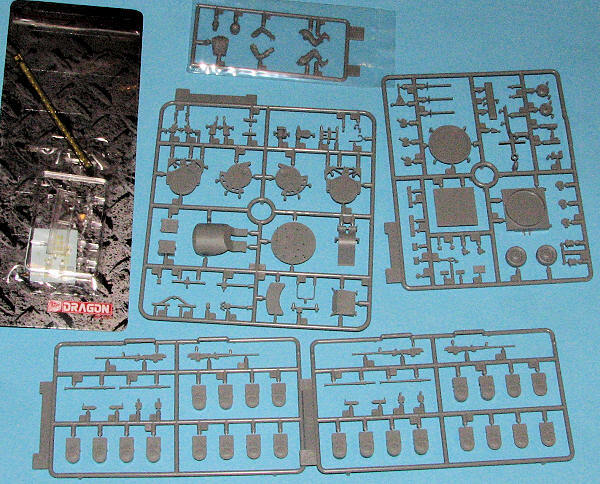 This kit does have a clear sprue, but all you use is the gun sight. Another nice addition is the inclusion of a seated gunner figure. One can position the jacks at various heights for use on rough ground and it appears that the guns can move in both elevation and azimuth. Instructions are well done with the usual Gunze and Model Master paint references. This is to be painted in a fetching Olive Drab with perhaps a tasteful mud appliqué to allow it to be more in tune with its surroundings. 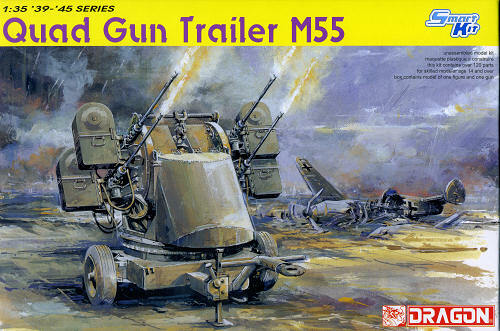 If you are like many of us and appreciate towed weaponry, then this would make a fine addition to your anti-aircraft gun collection. One thing for sure, this Smart Kit will be a good seller.